You are at a critical time in your life and evaluating different career paths. You know you don’t want to wait four years before making real money, but you want to enjoy what you do for the next 30 or so years. You also want to develop skills that make you increasingly more secure in your work and able to enjoy increasing income based on those skills and your experience. In short, you want to get to work as fast as possible in a solid career and have a promising future. If that sounds like what you’re looking for, have you considered welding? This infographic from Tulsa Welding School provides some intriguing insights into welding as a career. Read on to see what they have to share. Ship Building and Repair. You can find jobs needing skilled welders in shipyards and on ships in the United States and around the globe. Military Support. Companies that supply and support our military use welders for a number of functions around the world, from tanks and airplanes to nuclear subs. You can provide these services as a civilian under contract to the military. Pipeline Installation. The secret to supplying gasoline, crude oil, natural gas, and even water is in modern pipelines. This means the need each year for thousands of miles of new pipelines and the replacement of older pipelines will provide ongoing demand for qualified welders. The annual income you can generate in these specialty fields of welding range from $50,000 to as much as $200,000. 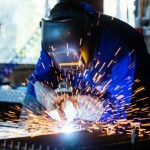 One of the more significant aspects of a welding career is that is an indispensable occupation increasingly in demand in higher-paying specialties. As robotics take over some of the more traditional and routing welding functions, welders are needed for tasks and assignments that no robot can handle in the foreseeable future. Interestingly, the infographic shows that as more robots are used for mundane tasks, more qualified human welders are needed to train, oversee and maintain those robotic welders. With an expected growth in this industry segment alone of more than 20 percent per year, the opportunities will continue to expand for welders experienced in robotics. If your goals include a little excitement in your work and the ability to grow, take some time to evaluate what welding could mean for you as a great career. Want to find a welding program in your local area?